The cholera burial ground near the station has already been included on this website. It’s very familiar to York residents, and probably of more interest to visitors. 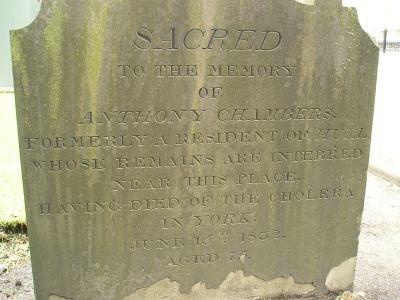 It was at this time of the year, early July, in 1832, that the cholera outbreak was at its peak. The first week of July saw 128 cases, with 40 deaths. The following contemporary account gives us a glimpse of one of those graves being filled. It’s from the diary of John Ford, a Quaker schoolmaster, and friend of Silvanus Thompson. The entry is dated 28 June. Drank tea with Thomas Backhouse at the Friars’ Gardens. We went on the City-wall which overlooks the Cholera Burial Ground. The service was being read over a poor woman who twenty-four hours previously had been alive and well. There was no mourner but the bereaved husband. The numerous recent graves and one more preparing, raised feelings of sympathy with the afflicted, and a sense of awe in observing these outward signs of the Divine chastisements. was a beautiful evening — the sky as clear — the birds as musical — the slowly-sinking sun as splendid — the river as bright and tranquil “as if earth possessed no tomb” — nothing in the external aspect of nature to remind us of Sin. If you stand on that same stretch of wall now the most striking thing beyond the wall is the large observation wheel. Within the walls Friars’ Gardens are long gone – under the ‘old’ railway station built a decade or so later, soon to be the new City of York Council HQ. This summer is looking rather grim, with constant rain. Water, water everywhere. But nothing like as grim as the summer of 180 years ago. At least we now have clean drinking water on tap, and have understood the importance of keeping it germ-free. As York-born John Snow tried so very hard to demonstrate, in the mid-19th century, fighting against the prevailing beliefs that the disease was caused by ‘bad air’ and Sin. 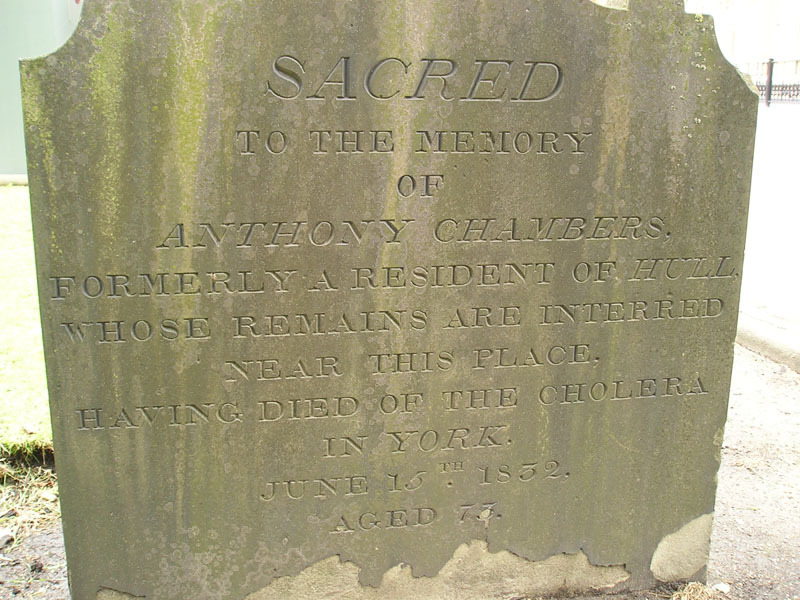 By Lisa @YorkStories • 6 July 2012 Histories, Memorials To link to this page's proper location please use the > permalink. I don’t think you’re alone in that Drake – I didn’t know either until I did the page on the burial ground. In recent years a plaque has been placed near John Snow’s birthplace in North Street – I meant to mention in the text. Have now added the link to the ‘Sources & links’ above. Is there a second cholera burial site outside Monk Bar? Several gravestones there – or is it an older churchyard from a church now lost? St Maurice’s church was on the corner of Lord Mayor’s Walk and Monkgate and the gravestones were in its churchyard. The church was demolished in the 1960s.